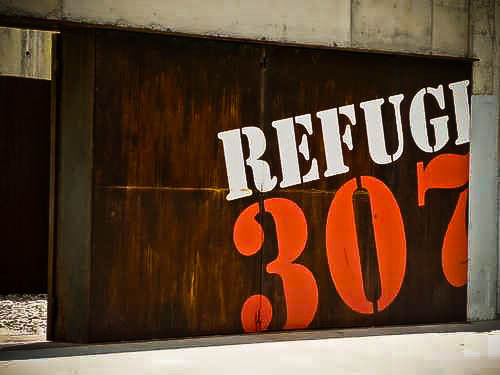 Shelters were built in the basements of homes and metro stations, but when the bombings intensified people began to team up together to build shelters. In total 1400 other bomb shelters were built during the two years of bombing. On the 13th of February 1937 Franco’s army had the first bombings in totaly his army caused 192 bombing raids. This shelter was built in March 1937, only a month after the first bombing. This shelter is also the only one that has been restored and is open to the public. 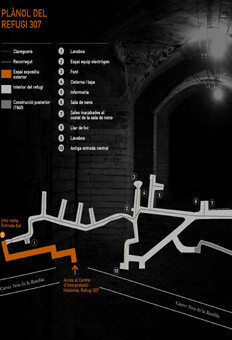 The shelter has 3 entrances onto Nou de la Rambla street and has almost 400 meters (1312 ft.) of tunnels. Included in the bomb shelter is a bathroom, water fountain, infirmary, fireplace and a children’s room. Visitors can experience what it was like for citizens at the time of the civil war. The tunnels themselves could provide short-term shelter for 2,000 people. The walls at the time were coated in lime to seal out humidity and to relieve the sense of claustrophobia. During harsher times in the 40’s and 50’s mushrooms were grown here for sale on the black market. The tour is only 45 minutes on Sundays. Admission cost 3 euros and advance booking is highly recommended. Enjoy our family apartment in Sarrià!